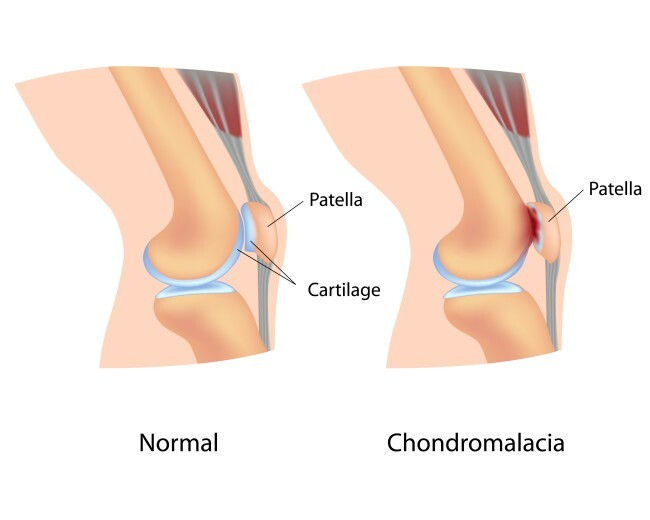 Chondromalacia of the patella is a condition based on the softening of articular cartilage, leading to its destruction. As a result of these changes, the cartilage loses its properties, it ceases to be tough and resilient, it becomes soft and cavities appear, which causes it to reveal and insufficiently protect the subchondral tissue and bone that are located under it. The main and fundamental problem of articular cartilage is that it is not in any way supplied with blood, vascularized nor innervated. Articular cartilage is nourished mainly by synovial fluid, at a very low level through the vessels bone. Despite this, synovial fluid constitutes the basis of its 'diet'. Poor quality of synovial fluid or its low levels lead to many other changes in the joints, most often with inflammatory basis. Therefore, it is important to constantly replenish synovial fluid. The main components of synovial fluid are hyaluronic acid and chondroitin. Hyaluronic acid is responsible for the good 'lubrication' in joints while chondroitin is literally 'food' for cartilage cells. Do you know only one package of Hyalutidin HC Aktiv is enough to supplement the synovial fluid in all the joints? Secondary - which are the result of a traumatic injury or a specific illness or treatment. Chondromalacia, unfortunately, occurs mainly in young people - approximately at the age of 20 years. More common in women than in men. The first symptom is pain in the front of the knee joint, which increases when staying in one position for a long time (standing or sitting), and also during movement (prolonged walking or running and climbing stairs, as well as performing squats). After all, it also happens that patella chondromalacia occurs in the elderly. It is the most common symptom of inflammation of the articular surfaces of the knee joint. magnetic resonance imaging or arthroscopy, that is endoscopic examination. Reading x-ray images or other test results it is recommended to pay particular attention to the observation of an exostosis on the edges of the patella. They are proof of an advanced stage of the disease. 3O and 4O - lead to degenerative changes in the joint. These changes can also occur in other joints of the human body, but most often they relate to the knee. In order to reduce the risk of patellar chondromalacia, above all, one should remember about precise warm-up before each exercise. Let's take care of our endurance throughout the whole year and not only when we are going skiing, for example. Regular exercise is key to maintaining the efficiency of the joints. 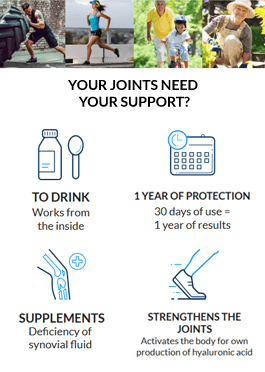 Did you know that Hyalutidin HC Aktiv contains as much as 15000mg of hyaluronic acid and chondroitin sulphate, that is the basic building blocks of the joints?